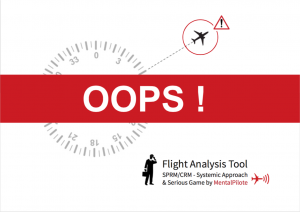 OOPS is a method for analyzing pilots/crews performances. It aims to reduce errors through better understanding of interactions between crews and operational contexts. It includes a performance analysis model which takes into account the crew resources and the threats. The model, based on the cognitive information processing literature, facilitates the identification of failures, with their relationships, and allows to come up with realistic dynamic training scenarios. Digital visualization tool of those scenarios, provided by the model, completes the method. The theoretical part of the model has been already used for training in a professional environment, for two years. The feed-backs were positive. As regards human performance, it is possible to adapt the model and its contents to ground activities.